This easy meatless Crustless Zucchini Quiche recipe is a delicious way to use up zucchini. Plus it’s frugal, too! Zucchini is one of those wonderfully versatile veggies. There are literally hundreds of ways that you can eat it! One of our favorite zucchini dishes is this simple quiche. It’s a cinch to throw together and is tasty ta-boot! And if you have any leftover, it reheats really well too! 1. Mix all ingredients, except zucchini and mozzarella, in a bowl. 2. Stir in zucchini and pour into a buttered 9″ pie plate. 3. Bake at 350º for 30 to 40 min. or until lightly browned. 4. If using mozzarella, sprinkle on top the last couple of minutes. Every summer, I always wish that I had more zucchini! I have tried to plant it a couple of years but after I get a few zucchini, the plant gets a blight and dies on me. Yes, this recipe is a nice change up from the typical ways that I knew of before to use zucchini. I hope you enjoy it! This was a very good recipe! Thank you! So glad you enjoyed it, Joe! Thanks for taking the time to let me know. 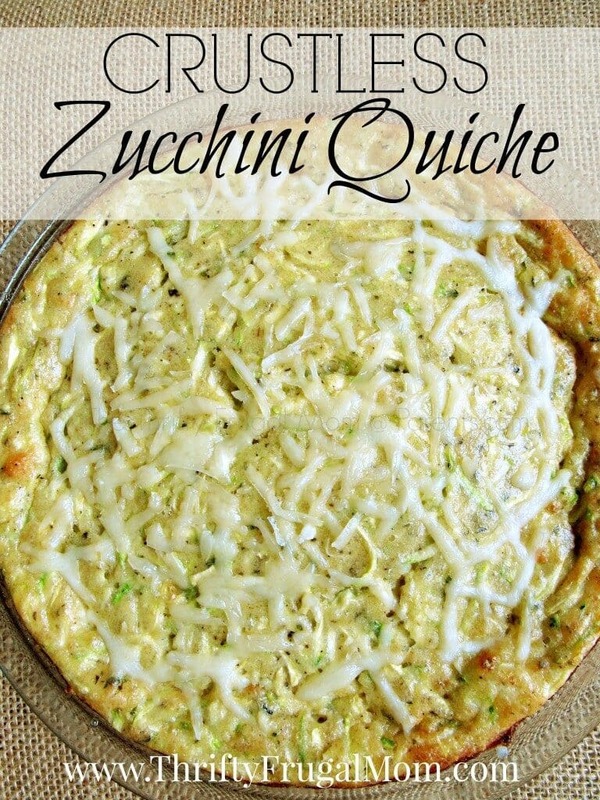 Yummy way to use up zucchini! Thanks for sharing at Women With Intention Wednesdays!